The right ski or snowboard is already waiting for you. We will be happy to help you find the best model for your needs out of 1.600 pairs of skis and 150 snowboards. Anything to do with skiing or snowboarding can be found in our sports shop. We can provide everything you need for a relaxing holiday. Convenient storage for your equipment. You can leave your skis or snowboard as well as your boots in our depot directly in the Stubnerkogel valley-station. We will prepare your skis or snowboard, so you can enjoy your equipment in perfect condition on the next run. And our bootfitters know for sure how to solve any problem with your boot. During the winter-season we welcome you daily from 8am to 6pm. Good advice and top products – we do our best to make your holiday a real pleasure. Always looking for the next trends. We always stock the latest trends in winter clothing whether you want functional or fashionable. As well we offer matching accessories like gloves, hats or goggles. Nobody wants to buy skis without knowing about their characteristics on the snow! We offer the possibility of testing nearly every model we stock before you buy. You can test several models that we think might suit you and therefore decide at your leisure which is the best ski for you. Up to two days testing are free if you buy skis. 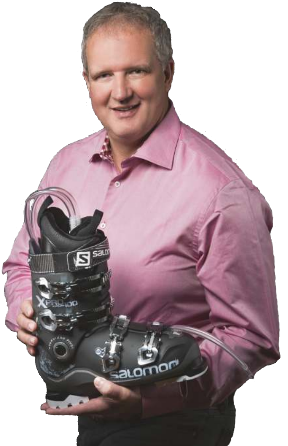 We share the idea that ski boots do not only have to look good, they also have to fit well. A perfect fitting boot ensures a direct transfer of power and will improve your skiing hugely. We can completely customise your boot or just the insole. Whether you go for these customised options or take one of our regular boots, our experienced bootfitters will guarantee you a good fit. To increase your safety, we offer helmets and protectors. And for those who love to go off-piste we offer avalanche-backpacks, transceivers and more. Get advice from our trained staff about the latest products, we will show you how it works before you leave the shop. As an authorised dealer we can also service and update your equipment as required. Benefit thanks to the possibility of tax-free shopping. All of our customers that are non-EU residents are able to get a tax-refund on their purchases. The conditions are listed here.